Nokia quickly snuffed out recent rumors that it plans to re-enter the smartphone market as soon as 2016. Here's why you shouldn't take Nokia's denial at face value. 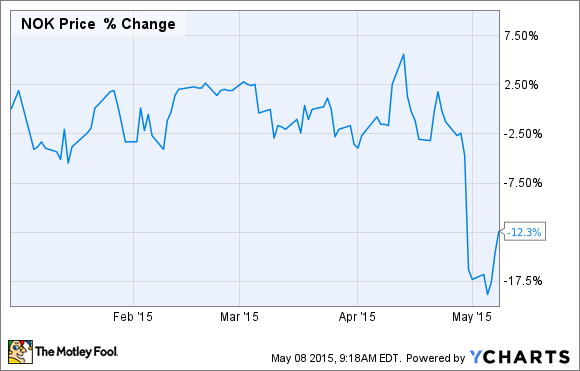 It's been a rough last two weeks for Nokia (NYSE:NOK) investors. Before its disappointing earnings release, the Swedish telecom giant's shares had more or less tread water for most of 2015. Beyond that, Nokia had enjoyed a number of positives. For starters, it secured the long-discussed merger with French-American communications equipment company Alcatel-Lucent, and Nokia's shares had rallied moderately over the past 12 months. Most importantly for the purposes of this article, there was word last month that Nokia intends to re-enter the smartphone market once its lockup period with smartphone sugar daddy Microsoft (NASDAQ:MSFT) (the proud owner of Nokia's former handset division) expires. However, Nokia quickly torpedoed the rumors. Nonetheless, here's why it will happen. On April 20, a number of media outlets reported on Nokia's plans of returning to the smartphone market. While this was more significant than your run-of-the-mill tech rumor, new product articles are published every day. It's Nokia's reaction that proved so interesting. Although there's no release on its IR site, Reuters and other trusted news outlets reported that Nokia went on the offensive against these rumors. Reuters quoted a statement from Nokia's website as saying, "Nokia notes recent news reports claiming the company communicated an intention to manufacture consumer handsets out of a R&D facility in China. These reports are false. ... Nokia reiterates it currently has no plans to manufacture or sell consumer handsets." That's a strong statement, and appears to close the case on last month's speculation. However, upon further examination and deeper reflection, I wonder if Nokia's seemingly strong denial actually negates the original news reports. What I find so interesting here is that the original reports never claimed Nokia would manufacture or sell smartphones. Rather, per Re/code, Nokia's strategy for future products aims to "Design cool products and then license the designs and Nokia brand to a company that will not only do the manufacturing, but also be responsible for sales and distribution." Now, this certainly involves a bit of reading between the lines, but if the Reuters report is to be believed, Nokia only explicitly denied it aims to manufacture and sell smartphones. As such, it seems Nokia really isn't denying that it plans to eventually re-enter the smartphone market. Rather, it's really just confirming that it won't handle anything but the design, which it will license along with the Nokia brand to another company to handle the ugly, low-margin business of fabricating and selling the device. It's a subtle difference, but one that technically leaves the door open for Nokia to get back into the smartphone market, while also allowing its efforts to remain under the radar until its lockup agreement with Microsoft expires at the end of the year. This denial also fits because a "design and license" model makes perfect sense for Nokia. Although it isn't the gold standard of the global cell phone industry like it was a decade ago, the Nokia brand still carries plenty of worldwide recognition. Even after its BlackBerry-esque debacle in the smartphone market, Nokia was still counted as the 98th most valuable brand in the world in 2014 in Interbrand's annual rankings. This "design and license" model would probably also prove attractive to Nokia because it would require little investment while giving it plenty of upside should its smartphone designs prove a hit with consumers. So while Nokia's recent comments might seem like a strong denial of its long-term plans to re-enter the smartphone market, there's also a number of reasons to think this might only be posturing on Nokia's part.